I'm preparing for a Social Media workshop next month called "Making Sense of and Success with Social Media" where the audience will be consultants who work with nonprofits in other areas (not technology). It will be more of high level overview given that it is only 90 minutes long. I don't always get a chance to do pre-workshop surveys, but in this case I had the opportunity to add two questions onto the registration form. 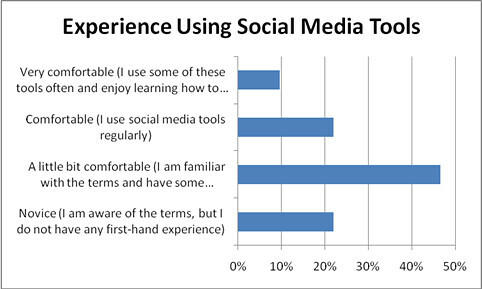 I wanted to know whether participants had actual experience with social media. I also wanted to get a sense of what content to include, so I asked for burning questions I usually do that as an icebreaker in the room, so this will save some time. I have a chance to reflect now on the data I've collected and think about the instructional design. In the United States, I've noticed that over the past 2-3 years, there is a growing divide in participants experience/knowledge gap. Typically, I have two groups of participants and as the chart above indicates, this group is no different - except that I probably have a greater number of people in Group 2. (1) Already Doing It, Want To Do It Better: The first group know the definitions of the tools and understands how social media has changed the dynamics between audience and organization. They've done some amount of experimentation. This may include some personal exploration like setting up their profile on social networking site or even a blog. They are now ready to start bringing their knowledge back to the organization and begin an organizational strategy. Some may already be doing that and want to do it better. They are looking for take-aways to spread social media behind the firewall and get around resistance from others within the organization. 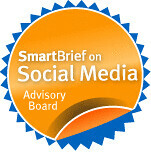 (Gordon Meyer has good reflection on the Community Media Workshop Blog). (2) Need A Basic Introduction: This group is new to social media, has not experienced directly but wants to get started using it strategically. They want to know what works and what does not and what the value is. They want to understand what they should do first, second, and third - small steps. Sometimes, people in this group are overwhelmed by the technology. This split seems to run along generational lines, but not always. I'm doing the workshop twice and I toyed with the idea of actually doing two totally different sessions, but I do not have an equal split - and I think there is value to having mixed levels in the group - if, you as the instructor, can make sure there is differential instruction. Given the numbers, it seems like most of the people fall into group 2 and having people in group 1 in the room opens the door for a perspective from a peer. I did a content analysis of the burning questions and a lot have to do with strategic use and understanding the benefits. Also, some new types of questions about training and education approaches for nonprofits and specific tips for under-resourced nonprofits. This is a short workshop and will be mostly delivered as an interactive lecture/demo style - with audience interaction. It's 90 minute workshop and there's a content to cover. Also, the seating is fixed. I wondered about a creative way to use already collected burning questions without taking up instructional time to rehash them again through an icebreaker. I pinged Dave Cormier and he suggested that I consider handing out the questions in paper and have people take notes or follow along "with a 'lets see if we can tease out the answer to these questions." This reminded of the Thiagi's Interactive Lecture techniques. So, need to re-order the questions to match the flow of the interactive presentation - and build in points for people to work pairs or threes to review the questions. Any trainers out there have a suggestion or ideas for ways to use content-related questions from participants collected in advance to help facilitate learning in the room? Beth - these are great tips that will also work in the B2B environment, thanks for sharing! Is there anywhere I can watch or listen to one of your presentations? Hi Beth. I love the idea of reworking their questions into a discussion guide / note sheet! Have you ever used wireless clickers for realtime feedback *during* the session? (The ones I've used are at http://www.turningtechnologies.com/.) This can tell you if the group is following you or lost. Of course, twitter could be used in the same way, but if they're on twitter they're probably not coming to this workshop. The clickers also allow the group to learn who they are, what they hope to accomplish, how confident they are, etc. In my experience there are often surprises. This can get everyone on the same page at the start of the workshop, which is a great way to start.